Whether to stake or not? Or give it the Tracy Chop. This is our so-called big border, with in the centre of the pic, the plant that everyone always asks about. It is a form of Eupatorium fistulosum, originally from North Carolina. It always grows to 3.4m every year and never blows over or flops - wonderful architectural plant. 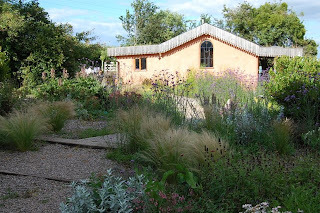 But the Sanguisorba tenuifolia to the left is embarassingly over - which it always does, and did in the last garden too. I have decided that it is one of those things for whom border conditions are simply too good, and it grows too well and cannot support its own weight. This winter I intend to dig it up and move into the meadow and see what happens; I assume competition will reduce its growth and height and it should stay upright. The sanguisorba is probably not a candidate for the Tracy (DiSabato Aust) chop, as I think it would just produce lots of flower heads lower down and look a mess. The infamous flopper Campanula lactiflora however has done very well with a Tracy chop, bushing out and flowering for more than 2 months. But the rain will have helped.